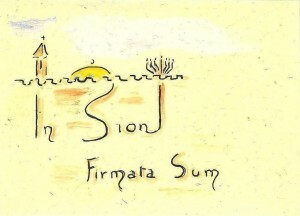 For Ben Sirach 24:10, Sion/Zion is the hill of the Jerusalem Temple, the place where the Lord is present in the midst of God’s people. That is the meaning that is given several times in 1 Macc 4:37; 5:54; 10:10-13. Originally, Zion was the name of the Jebusite fortress conquered by David (2 Sam 5:9). It was in the higher northern area that today is called the Ophel. 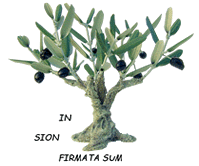 Once taken, it received from David the name “City of David”. At the time of Ben Sirach and of the author of 1 Maccabees, the name Zion was located further north and designated the hill where Solomon built the Temple. During the time of the author of Maccabees, the name “City of David” also moved its location (1:33), and according to some it then designated the steep promontory on the western side of the Temple esplanade, beyond the Tyropeon Valley. For centuries now and until today, the two names are located in the west. David’s citadel, the remains of the Jebusite fortress to which the title “City of David” was given, is next to Jaffa Gate, whereas Zion or “Mount Zion” is the name given, at least since the 4th century CE, to the hill on the southwest of the present-day Old City, where are the remains of the Cenacle. Part of its external wall goes back to the first century CE. Mary is quite explicitly the Daughter of Zion in the account of the Annunciation: “Rejoice, full of grace, the Lord is with you”, echoes Zephaniah 3:15-17. According to the account of the Visitation (Luke 1:39-56), Mary is Zion in reference to the Temple, the sanctuary of the divine Presence in the Ark of the Covenant. Luke got his inspiration for this from the account of the Ark’s ascent to Jerusalem (2 Sam 6:1-19).